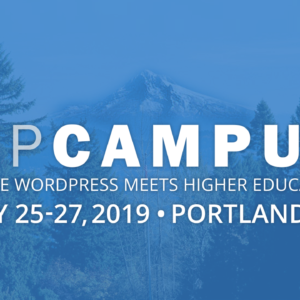 WPCampus is a community and conferences for web professionals, educators and people dedicated to the confluence of WordPress in higher education. Our goal is to provide a wealth of knowledge for anyone who’s interested in using WordPress and allow people to share and learn about WordPress in the world of higher education. Much like online businesses or blogging, higher education is a world of its own with unique challenges, content, stakeholders, and target audiences. WPCampus is inclusive of all facets of higher education, whether you’re a faculty member, a content strategist, a designer, social media manager, or a student. If you are not already a member of the WPCampus community, we invite you to follow @wpcampusorg on Twitter and learn more on how to get involved. We have a thriving Slack channel and would love to have you join the conversation.